Today is going to be a good day! We have all made it through the first full week of 2009, go ahead and pat yourself on the back and your neighbor and/or pet (whatever) too! It’s going to be 60 degrees here today in Northwest Arkansas, I have a cute outfit on today and I have managed to drop 4 pounds this week! MZ is back home from LA and we have a super laid back weekend ahead of us. Hopefully he’ll have exciting news coming soon!!! My project I’ve been working on since August will OFFICIALLY LAUNCH on Saturday-ish! Wahoo!!!! Don’t want to jinx it so I’ll have to keep it a bit of a secret but it’s exciting, for me atleast. If you notice to the right – the link to Blogwell 2009 – I’ll be there in a couple of weeks – for work, not my own personal blogging, but I hope to learn tons. Anyone else going? If so, let me know! 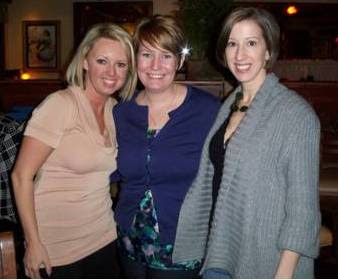 On Wednesday night, the stars aligned and Lynn and Lindsey were able to meet me for dinner. Despite them making fun of me because of my “jaw” issue, a good time was had by all. Happy Friday to all, and to all a great weekend! I’ve been robbed … already … at 8:26 in the am on a MONDAY! Please share your learnings from Blogwell 09 when you get back. PS – Have a GREAT time at Blogwell!! Wish I could be joining you!